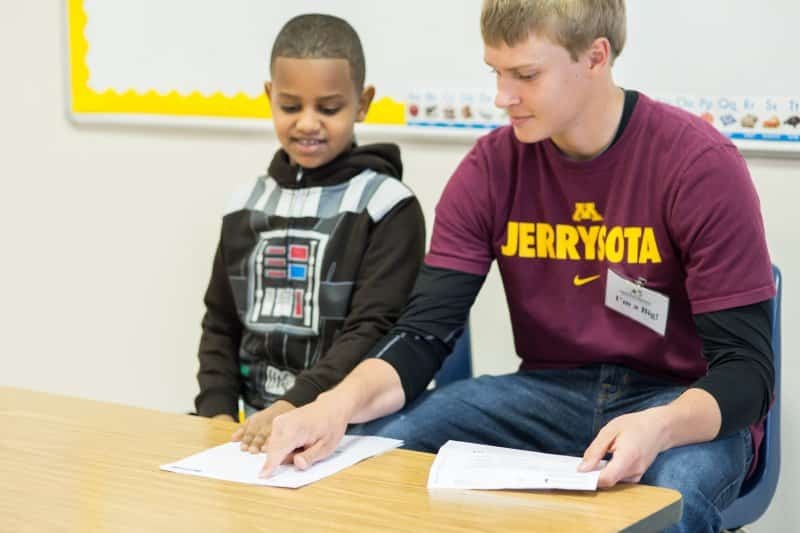 Regardless of weather conditions, a difficult commute, or a busy schedule, 19-year-old University of Minnesota sophomore and Kyle meets with his 8 year-old Little Brother Hayyuu at his elementary school every week. The two spend their time getting to know each other by doing homework together, chatting, and playing games. In just a little over a year, Big Brother Kyle’s dedication has made a profound impact on the way Hayyuu views the classroom. “Hayyuu has a much better attitude about school and is starting to think about the idea of higher education, something he initially said he didn’t think he was going to attend,” reflected match coordinator Paula. Match Coordinator Paula continued, “Kyle truly cares about Hayyuu…He does a great job of influencing and guiding Hayyuu to set him on the right path.” For Kyle, it seems as though mentoring is more than an extracurricular activity; it’s a dedication to provide a strong, enduring, and meaningful friendship. The two continue to meet weekly during the school year. Hayyuu knows that he’s a priority for Kyle. “We laugh a lot. He tells me that I can do anything. He is the best Big Brother anyone could ever have,” enthused Hayyuu.